​I live in Melbourne, Australia and manage HOPE worldwide (Australia). In December 2015 I had the fortune of serving with volunteers at the HOPE Youth Corps in Fiji and when I heard about the Cyclone that struck on 20th of February 2016, I was eager to know how everyone was doing - my spiritual brothers and sisters in Fiji. I spent quite a bit of time on the phone to Alex Hernandez, who leads the churches in Fiji and lives in Suva. Though communications were repeatedly broken, he gave me an update on how things are going in Fiji after the cyclone. Many places were still without power or water. There was a lot of flooding, with a high storm surge and that many homes were swept away by wind and water. Please be praying for the disciples, the wider community and the ongoing relief effort! On Saturday night, February 20th as curfew was in place many people in Fiji stayed in their homes and prayed as the category 5 Cyclone tracked it’s course from West to East across the Fiji Islands, the full force just missing the main cities of Nadi and Suva, but leveled many villages across the interior and remote islands that lay in its path. The last major cyclone struck 3 years ago and the death toll was around 30. 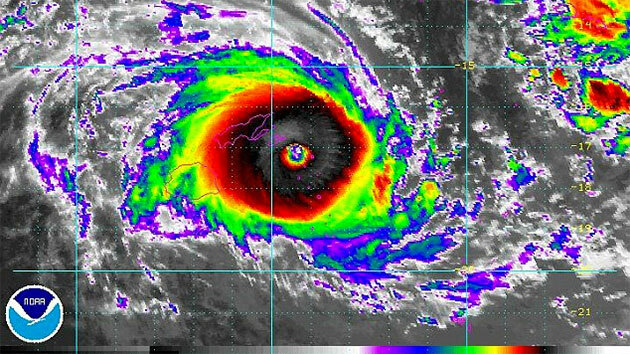 As the current death toll climbs to above 50, this is now known to be the worst Cyclone in Fiji’s recent history, as well as being the strongest in the Southern Hemisphere. The HOPE Youth Corps served in Suva and Nailega village (right)- about an hour outside of Suva. I was encouraged to hear that Nailega had survived and everyone was safe. Also the library that the HOPE volunteers had renovated was still standing! Other villages further out were not so fortunate. George, a brother in Nadi shared how his family were together listening to the radio updates as the Cyclone struck their home. As the roof started to shake they got down on their knees to pray. The shaking stopped and at the same time the announcement was heard on the radio that the cyclone had changed course- the family responded by shouting out praises to God! Another brother shared how he and his family were fine- just their windows smashed from the force of the wind. One of the brothers, Kenny, a taxi driver in Suva shared how he was desperate to get home to his wife who is diabetic and has an amputated leg. During the storm he passed police check posts and dodged falling trees- and made it home without injury to himself or any damage to his car (his only means to an income). ​People in Fiji are very connected to each other, they have strong communities and so when tragedy strikes everyone shares the grief. One of the sisters has family who live in a place called Koro where many villages were destroyed. There were many stories of sadness: 2 children being sucked away, a mother running out to get clothes for her children and not returning, people drowning due to high tides, others injured through falling trees and fallen electric wires which are still a hazard. One community took refuge in a church, but this was short lived as the roof was torn off. A father ran with his 10 month old baby trying to escape the floods, but unfortunately his grip was not tight enough and the baby was swept away. Alex was amazed to see how the disciples and the community at large are serving and supporting each other. ‘The spirit of the disciples and people is like that of Acts 28:2 ‘the Islanders showed us unusual kindness’. Fijians are very resilient and also they do not want to complain. When you ask a Fijian how they are, you will often get: ‘I’m fine’ despite real hardship. This makes assessing needs tricky. The international response was encouraging: relief teams from New Zealand, Australia and China. Organisations and local government assessing needs and providing assistance. ‘Everyone is doing something to help their home villages or the villages near them...it's amazing’. One brother, Lone has family on a remote Island- the only way to reach the Island is a 6-hour boat journey. A text Alex received a few days after the Cyclone: "...its Lai...just wanna ask for your help to assist my family who was affected from TC Winston last wk..I will be going to Levuka on Saturday taking some stuff to help them cope..anything that will put smile to their faces will be appreciated..."